Colon cancer is the third most common type of cancer worldwide. Epidermal growth factor receptor (EGFR) plays a crucial role in the (patho)physiology of the disease. EGFR controls vital cellular processes, while this action is associated with poor prognosis. 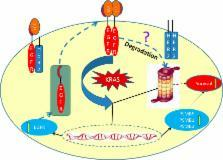 In addition, K-Ras mutations are associated with the promotion of the disease and the anti-EGFR resistance. The ubiquitin-proteasome system also plays a very important role in cancer, modulating the cell cycle and other cellular processes such as the growth and the survival of cancer cells. Proteasome inhibition affects, in several cases, the action and the protein levels of EGFR. Nevertheless, little is known whether the reversed option is possible. In this study, we therefore investigated the impact of EGF/EGFR signaling axis on gene expression and the proteolytic activity of the proteasome subunits, as well as whether nuclear factor erythroid-derived 2 related factor 2 (Nrf2), an activator of proteasome expression, plays a role in this process. Moreover, we evaluated whether EGF regulates the expression of its own receptor and the proliferation rate of DLD-1 (K-Ras-mutated) colon cancer cells. The obtained data showed that although EGF has no significant effect on the proliferation of DLD-1 colon cancer cells, it significantly upregulates the expression of EGFR as well as the expression and the activity of the proteasome, suggesting that the EGF-mediated proteasome activation could possibly lead to enhanced EGFR degradation, leading to auto-regulation of EGF-EGFR pathway. Nrf2 activation did not induce proteasome gene expression. Copyright statement: © 2014 M.-I. Ellina et al. Signal strength dictates phosphoinositide 3-kinase contribution to Ras/extracellular signal-regulated kinase 1 and 2 activation via differential Gab1/Shp2 recruitment: consequences for resistance to epidermal growth factor receptor inhibition. Ligand-dependent activation of the epidermal growth factor receptor by secondary bile acids in polarizing colon cancer cells.